Amazon.com released an interesting study last week: The Most Romantic Cities in the U.S. They based this on per-capita purchases by customers in cities of over 100,000 people – as in how many romance novels they bought, how many romantic comedy movies and television shows they rented or purchased, and purchases of CDs and sexual health products. The results may surprise you; I know I was. Apparently, Virginia is still for Lovers, but not as much as last year – and not as much as Tennessee and Florida. New York certainly isn’t – NYC was at the very bottom of the list. The other surprise? Two Ohio cities made the top 20: Cincinnati at #5, and Dayton at #9! So where are all the romance novels that take place in Ohio? It’s the first place that comes to mind when choosing a setting… oh wait, that’s just me. Or is it? If you’re looking for a good contemporary romance, turns out it’s not hard to find one set in Ohio. Big name authors like Lori Foster, Jennifer Crusie, Toni Blake, and Diane Castell have all written a number of romances that take place in Ohio. Some are in big cities, like Columbus or Cincinnati, while others feature the ever-popular small-town romance, like Toni Blake’s series set in the fictitious town of Destiny. 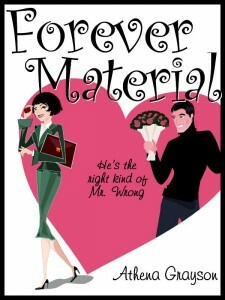 A recent read I enjoyed was Forever Material, a romantic comedy by Athena Grayson, which takes place in an unnamed suburb of Cincinnati. But what about historical romance, or paranormal? Those are a little trickier. The only historical that quickly comes to mind is Into the Valley, by Roseanne Bittner, which is several years old, but very good. For paranormal, there’s Kim Harrison’s Dead Witch Waling urban fantasy series. I haven’t read these, so I don’t know how much romance is in them, if any. Those all take place in Cincinnati. So where’s the love for #9 on the list, Dayton? Offhand, I can’t think of any romance novels set in Dayton except for one, and you need venture no further than this website for that. 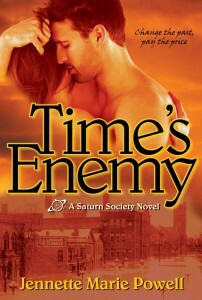 Time’s Enemy is historical, it’s contemporary, it’s paranormal. And it’s set in Dayton. Do you know of any good romance novels set in Ohio? Especially historical or paranormal? Especially Dayton?? Bring ’em on! I want to read them. This entry was posted in Blog, Good Books, My Town Monday and tagged Athena Grayson, Columbus, contemporary romance, Dayton, good books, Jennette Marie Powell, My Town Monday, Ohio, Ohio romance, paranormal romance, reading, romance, small town romance, time travel, Time's Enemy, Toni Blake, writer. Ohio, huh? None come to mind. But that’s an interesting satistic. Why not Ohio, after all. Thanks for sharing Jennette! A story has to take place somewhere. 🙂 I like Ohio. Oh wait, I’m not published – YET! I read that article and kind of took it the opposite extreme. I figured we’re on that list because we’re the most likely to want to go someplace ROMANTIC!! That’s why we read and watch all that romance stuff. Right??? I’ve long been aware that more stories seem to occur in places like California, New York, Chicago, and Florida. There are also small town novels, but not many surburbs in what I’ve read. I can’t complain that my home state of Texas doesn’t have its share of play; it does. Meanwhile, my mother’s home state is Ohio, so it’s nice to see some books set there. Great article, Jennette! Interesting numbers, although now I’m thinking about Amazon studying all my purchases, also very interesting. I can’t think of any Ohio settings off the top of my head, but I’ll be looking out for it! Stacy, that was what I expected the survey to be about too, LOL! And vampires in Ohio?? I’m so there! Keep those submissions out, and here’s hoping one of those editors will bite soon (pun intended)! Julie, you can hardly turn around in the romance section of a bookstore without finding several Texas romances – I think it’s one of the most popular locales. Thanks for stopping by! Coleen – yup, now that Amazon’s a publisher, it’s easy to see where they are at a major advantage: they have all that customer data! Thanks for your input! Very interesting. Good to know we live in romantic places. My contemporary romance novel is in Ohio. TWO BROTHERS is set in a fictional small farming town east of Cincinnati called Bedinford, OH. What a surprise–Cincinnati #5 and Dayton #9 of the top romantic cities!! I need to read some of those local romamnces;)! Thanks for sharing, Jennette! Louise – I didn’t know that! Hmm, might be a blog topic in there – thanks for the info! Maria, thanks for stopping by! In my story The Nun and the Narc, Sister Margaret Mary belongs to a convent in Northern KY. Not exactly Ohio, but close by. The Turning Stone Chronicles, by C.D. Hersh, are set in Cleveland. Neither are pubbed books yet. Well if it wasn’t for you we would not have the appreciation for your great state that we do now! And no I can’t depend on my husband to give me this information. But then he’s from cleveland which I understand is like a whole other country. LOL! I’m Kidding! Thanks Jen for this information. That’s a fascinating fact. I haven’t found or read books set in Ohio but I’d love to read those books you mentioned above. Nice! Thanks!